As of 1994, there were 35 laboratory-documented cases of lead toxicity from a retained lead missile in the English literature.19-20 Fifteen of these have been reported since 1980. Onset of symptoms has occurred from months to up to 27 years after being shot. In mostof thecases, themissilewas within a joint, a bone, or an intervertebral disk. Ithaslongbeen recognizedthat synovial fluid is capable of dissolving lead. A richvascularsupply tothetissue surrounding the bullet and prolonged bathingof thebullet witheitherbursal or synovial fluid makes the development of acute lead intoxication more likely. 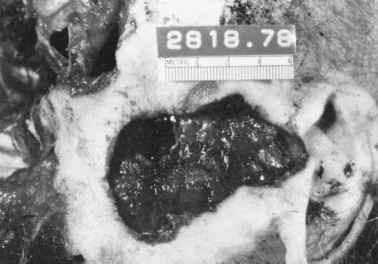 In a fatal case of lead poisoning reported bytheauthor, theindividual was a 54-year-old woman shot in the thigh by her son with a .32-caliber revolver.17 X-rays taken at the time the deceased was shot showed a flattened, deformed lead missile lodged in the soft tissue near the distal femur, just proximal to the condyles and antero-lateral to the bone. Small fragments of lead were present adjacent to the main mass. The location of the bullet was consistent with its being in or in communication with the suprapatellar bursa. Five months after being shot, the victim was admitted to a hospital with severe anemia. Hemoglobin was 6.9 gm/dl, hematocrit 21%, MCV 84, and platelets 388,000 mm3, with a white blood cell count of 5600 mm2. The reticulocyte count was 5%. A smear showed basophilic stippling. The patient had been seen 9 months previous to this admission, at which time her hematocrit was 39% and hemoglobin 13 gm/dl. One month before this last admission, she came to the hospital complaining of constipation and gnawing dull periumbilical and epigastric abdominal pain. She had had a 20-lb weight loss over the previous 4 months. During her hospitalization, a diagnosis of lead poisoning was never considered. She suffered multiple episodes of grand mal convulsions and died 14 days after admission. At autopsy, the brain was swollen with uncal herni-ation and necrosis. Secondary brainstem hemorrhage was present. Analysis of the blood obtained postmortem revealed a lead level of 5.3 mg/L. Fortuitously, antemortem blood obtained 5 days before death had been retained and revealed a lead level of 5.1 mg/L. Any lead level above 0.6 mg/L was considered toxic in the hospital laboratory. 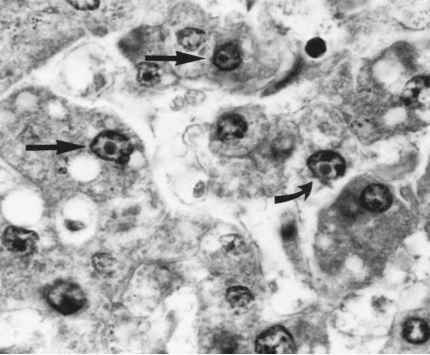 Figure 9.3 Eosinophilic intranuclear inclusions in hepatocytes.